Volvo V90 Performance, Engine, Ride, Handling | What Car? Volvo has used its appealingly named Power Pulse technology on the V90's D5 engine. This uses compressed air to help the turbocharger kick in faster, and the result is superbly urgent acceleration from low revs, helped by standard four-wheel drive. 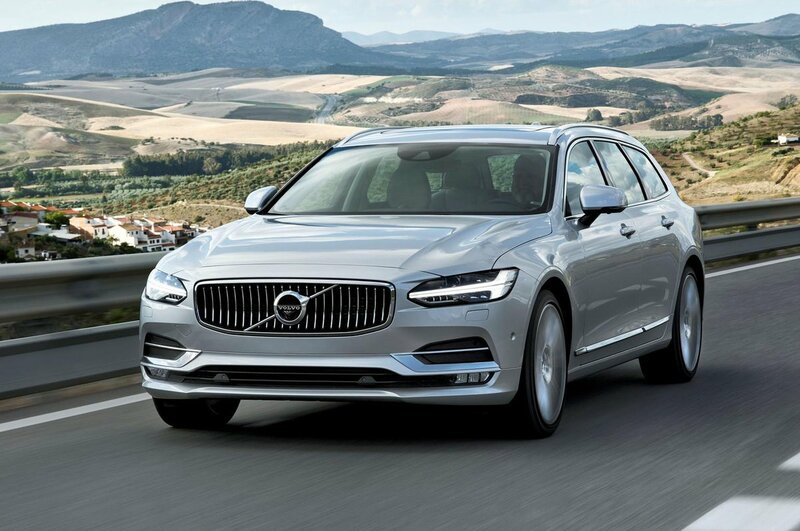 With less low-down torque than the D5, the entry-level diesel V90 D4 requires significantly more throttle input to get up to speed. 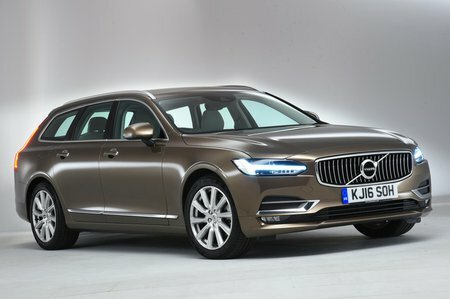 However, the linear power delivery of the D5 has been retained and the engine is powerful enough for most situations, if not quite a match for the equivalent E220d Estate. If you prefer petrol power, there’s a 187bhp T4 engine that's fractionally cheaper than the D4 but is much harder to recommend. It doesn't have as much power from low revs, and while it's more refined than the D4, it is pretty coarse for a petrol engine. The 247bhp T5 is actually a better bet; although it costs a little more to buy, it's slightly more efficient and smoother while feeling properly punchy. Alternatively, you can opt for the T8 Twin Engine. This doesn’t lump another turbocharged petrol engine in the boot; instead, you get a battery pack and an electric motor powering the rear wheels. This reduces CO2 emissions and allows you to run for up to 28 miles on electricity alone if you charge the battery up. Just remember, the faster you go, the quicker the battery gets drained. On a typical commute with some motorway miles, the electric-only range could drop to around 20 miles or even less. The other advantage of the battery power is performance; the T8 gets from 0-62mph in less than five seconds. 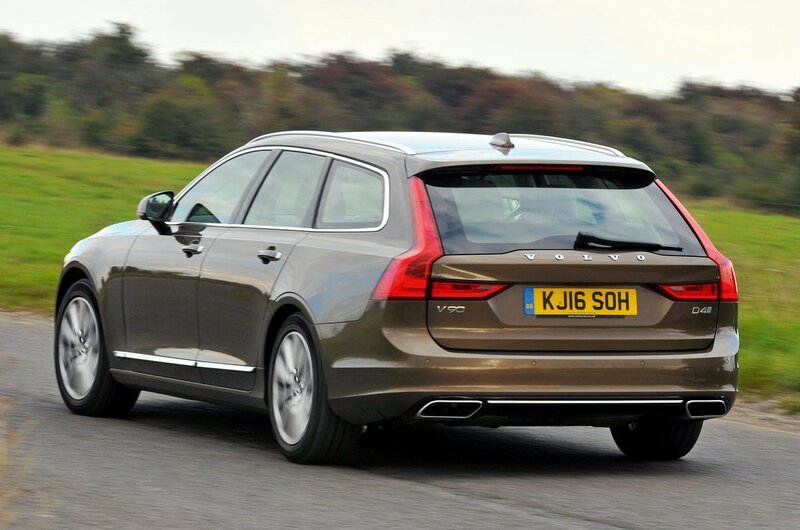 The V90 in all its guises is generally a peaceful cruiser, although not to the extent that it matches the whisper-quiet BMW 520d Touring. Engine noise in the diesels is a nuisance; at idle, there's a mild rumble that seems out of sorts with a premium wagon, but this fades to a reasonable background thrum on the move. The T8 is virtually silent when running on electricity, while the car’s petrol engine is much more refined than the diesels. The eight-speed automatic gearbox fitted to all versions changes smoothly, although again, without quite matching the seamless shifts of the 5 Series. It can also dither when you ask for a burst of acceleration, hindering your progress. At least the T8 shuffles between power sources without disturbing you too much. You don’t really notice the engine start and you rarely notice the car switching from electric to engine power and back again. At speed, only the ruffle of wind noise from those big door mirrors intrudes on your awareness, because road noise is kept nicely at bay in all variants. Ride comfort is crucial in family estates, and this is another area in which the V90 impresses, if you tick the box for the optional adaptive dampers that includes air suspension at the rear. It helps the V90 glide along motorways with a relaxing buoyancy and ride most surfaces at town speeds in a composed fashion. Only particularly vicious ridges send thuds through the body, something the E-Class tends to suffer from too, but less so the 5 Series. Without the adaptive dampers, the V90 transmits a few too many road imperfections to its occupants. One note of caution, though: beware of R-Design trim. Again, on adaptive suspension it’s fine, but as standard it gets a 15mm lowered ride height, bespoke dampers and stiffer suspension that makes the ride choppy. The adaptive dampers also sharpen up the V90’s handling, making it marginally more composed through corners than the 5 Series. However, on the standard suspension the cross Country falls short of both the 5 Series and the Mercedes E-Class Estate for handling, feeling a closer match to the lethargic and ultimately unrewarding Audi A6 Avant. It remains fairly upright though tight corners but never feels particularly eager to change direction, and the steering doesn't provide much feedback. At least the standard four-wheel drive on the D5 models provides the V90 with plenty of traction when accelerating out of slow corners. It’s worth noting that the heavy battery in the T8 makes it feel less agile than the regular models, something that could be a disappointment if you pick one as a high-performance estate. The steering wheel occasionally writhes around in your hands slightly if you accelerate hard from a standstill, too. The T8 may be four-wheel drive, but the front wheels receive more than three times as much power as the rears.